The two story farm house was originally built in 1896 and was the long time home of Maude Frakes. 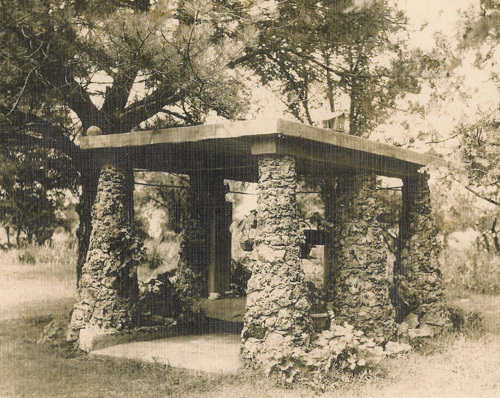 After the death of her husband Marion in 1930, she began the developement of the stone and concrete porches, gazebo, fountains, pools and other garden monuments. Stones were collected from across the country to be used in the constructions. Included were stones from every state, petrified wood, arrowheads. stalactites, stalagmites and even smooth round stones from Denmark. Most notable were the concrete elephants which were part of her large collection of elephants relating to her political affiliation. Most of the concrete elephants still remain while the rest of her vast collection was lost to treasure seekers, as were many other possessions after her death in 1954. The property became sadly dilapidated and overgrown with English ivy, trees and brambles.